- Whisk together the eggs and milk in a small bowl and season with salt and pepper. Melt butter in a pan over a medium heat. - Stir the eggs into the melted butter. Cook, stirring constantly, for 3-4 minutes, until the eggs are softly scrambled. Remove from the heat and leave to cool. - Spread the slices of bread to the edges with the remaining salted butter, top with the lettuce leaves and cut each slice in half. Leaving one curl of lettuce visible on each slice, spoon one quarter of the scrambled eggs over each sandwich. 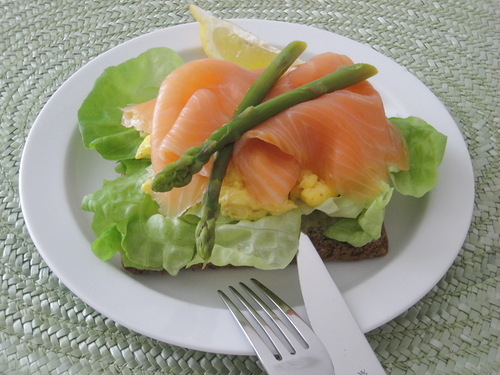 - Arrange the smoked salmon to cover the eggs completely, folding or pleading the slices if necessary to fit the bread. Garnish each sandwich with a quarter slice of lemon, tucked into a fold of the salmon and a sprinkling of chives or adding thin freshly cooked asparagus.